Cruise with Theresa & Cindy on our next Art Cruise. We recently cruised from Quebec City to Boston, cruised the Mediterranean from Rome to Greece, Turkey, and Croatia, and are now looking at the Caribbean and Alaska for future cruises. Be Inspired by Travel! We always have bonus credits for your room and work hard to get you the best room in your category. We have been asked many times to put together an artist’s trip with an optional onboard workshop! Come paint with us on location or do your own thing. We suggest optional group gatherings, tours and group dinners on the ship. We get a block of rooms and offer competitive rates with preferred rooms in different categories. We arrange or make excursion suggestions so you can choose to join the group or be on your own. Would you like the least expensive inside room? An Ocean View? Lanai? Verandah? Or the Deluxe Verandah Suite? 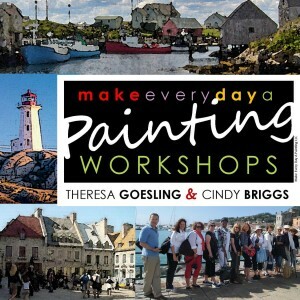 Cruise with us and paint, make new friends, explore beautiful locations. Sign up for our newsletter for up to date announcements.